The Harkers BOTY competition 2018 received many entries, with all participants competing for the chance to win £250 worth of Harkers products over 3 different categories; including More than 300 mile (long distance), Less than 300 miles (sprint) and new for 2018 – Young Bird of the Year. Following the announcement of the results in the British Homing World in December, Sales & Marketing Director for Harkers James Hancock was pleased to present the winners with their prizes at the Blackpool Show of the Year earlier this month on 19th-20th January. The full list of results can be seen here. 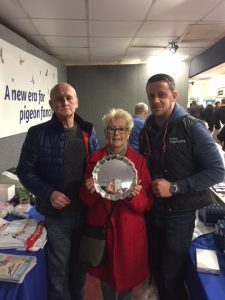 Big winners in the competition Mr and Mrs Trodden of Gretna received the Sprint category prize, with their pigeon SU16S5819 and were able to collect the Hormoform Bird of the Year trophy from James at the Blackpool Show. Harkers would like to congratulate each of the winners and runners up, and say a big thank you to everyone who entered the Hormoform Bird of the Year competition 2018.